We are back again with our monthly printable collaboration. Each month this year, 8 blogs are bringing you free printables for the upcoming holiday. 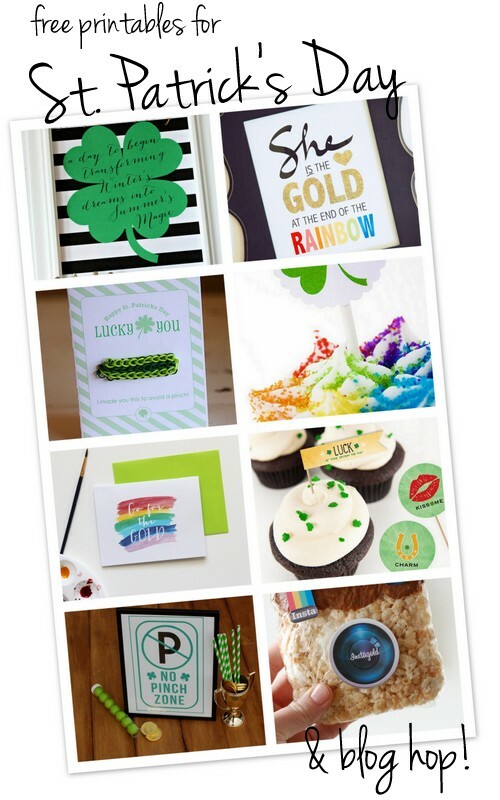 Now that Valentine’s Day is behind us, it’s onto St. Patricks Day, and I’m excited to share with you all these cute ideas! I’ll share the blog hop link list below so you can hop on over to find all of these cute (and free) printables, but first…I’m excited to share our InstaTreats with you! 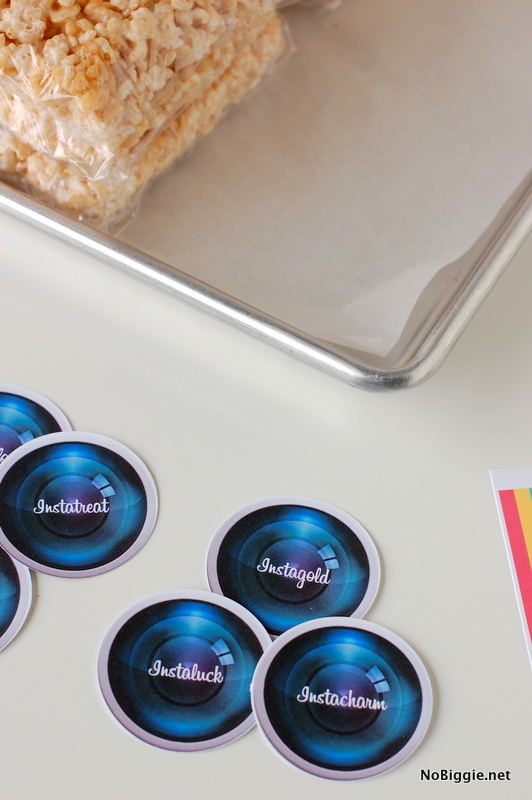 We’ve all heard there’s a pot of gold at the end of the rainbow, so there must be #instagold at the end of the #instarainbow right? 😉 …and by gold I mean a golden rice krispie treat dipped in chocolate of course. 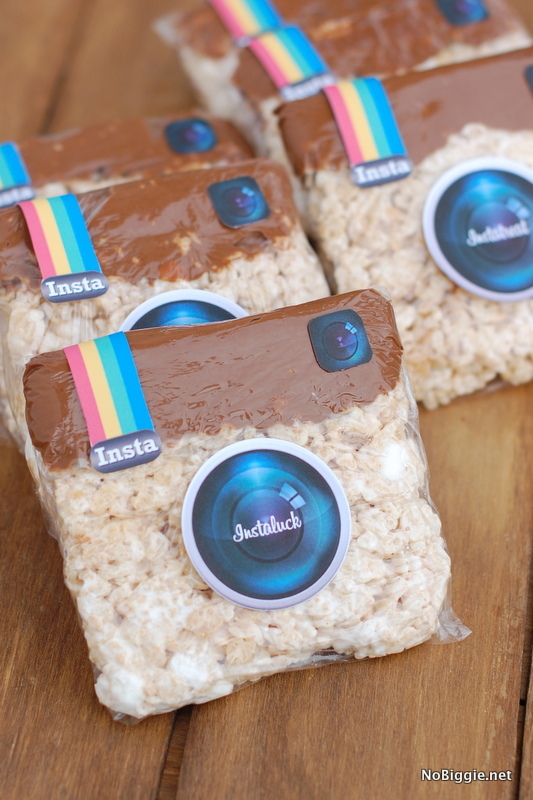 I’m a big fan of Instagram, it’s definitely one of my favorites when it comes to social sites. Last month I shared tips to get rice krispie treats great every time, and since then I love my new found confidence in making them. They turn out great every time, and they’re so quick and easy. To mix things up I dipped them in chocolate, and that’s where the inspiration for this fun printable came to be. I melted guittard milk chocolate chips in a microwave safe bowl and dipped only one third of the square treats in the chocolate. Then I let them set for a bit on plastic wrap before wrapping them up tight. 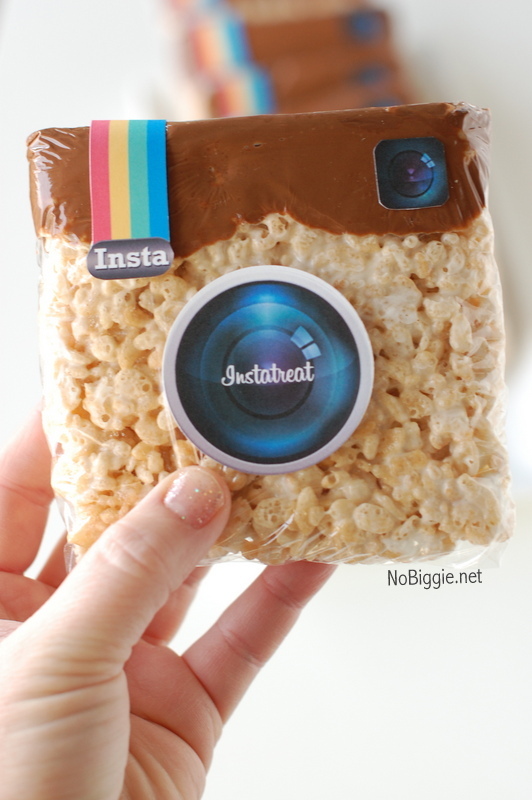 One 9×13 pan of rice krispie treats makes 6 4×4 inch square treats. To help get perfect square treats every time, I took a sharpie and drew a 4×4 inch square on a piece of tinfoil. Then just lay a piece of clear plastic wrap over the top and mold it to fit. Now for the free printable, this is what it looks like when you print it out. The big circles are exactly 2 inches, so you can use a two inch craft punch for a perfect circle. The rest I cut out with our paper trimmer and scissors. Here’s where St. Patrick’s Day comes in to play. Words like: gold, good, luck and charm can make it work for the big day. We also have instalove and instatreat along with two without words in the center circle. Big glue dots worked great to get them all to stick onto the plastic wrap. Once you have them all wrapped up, they sure do look cute all lined up together. 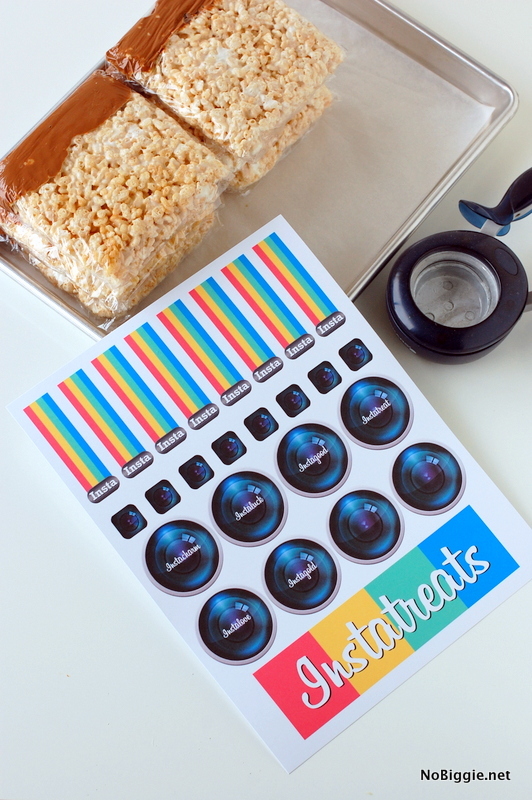 You could easily make a bigger batch of treats and just print off more of these prints. 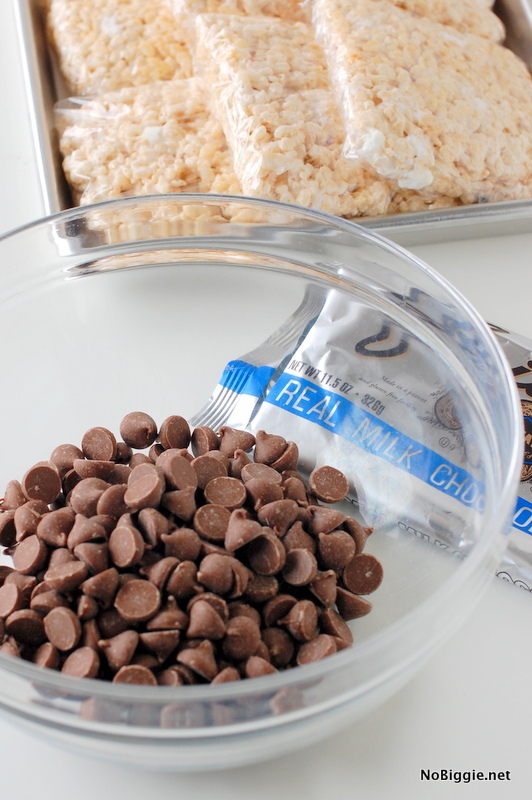 If you make 24 rice krispie treats, you will need to print this off 3 times. 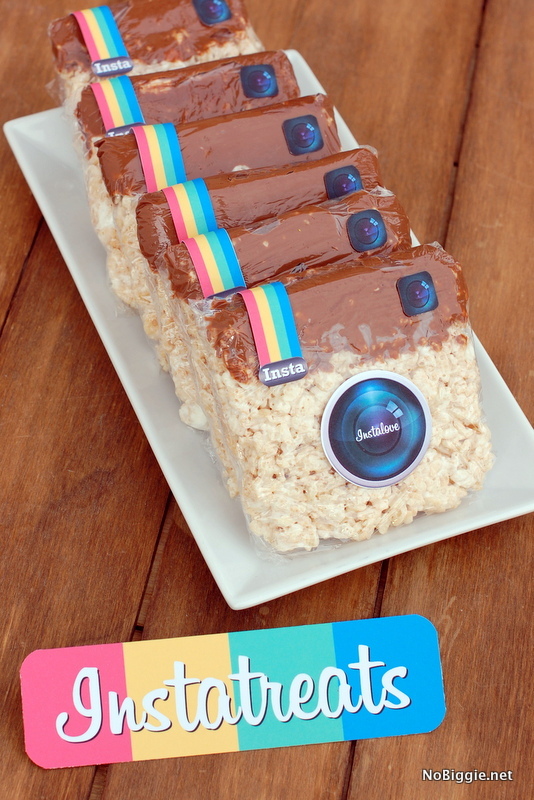 These would be a hit at an #InstaMeetUp! 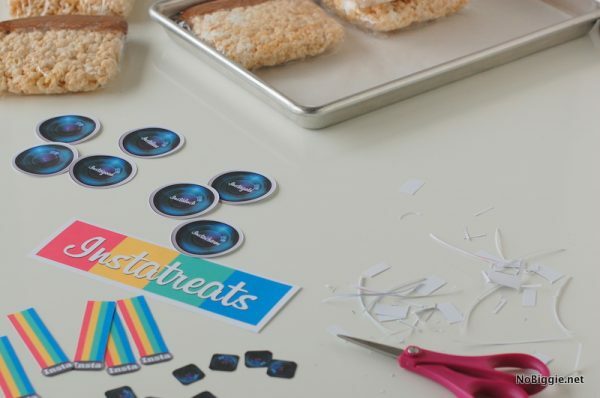 I bet you know someone right now that would love a little #instatreat. 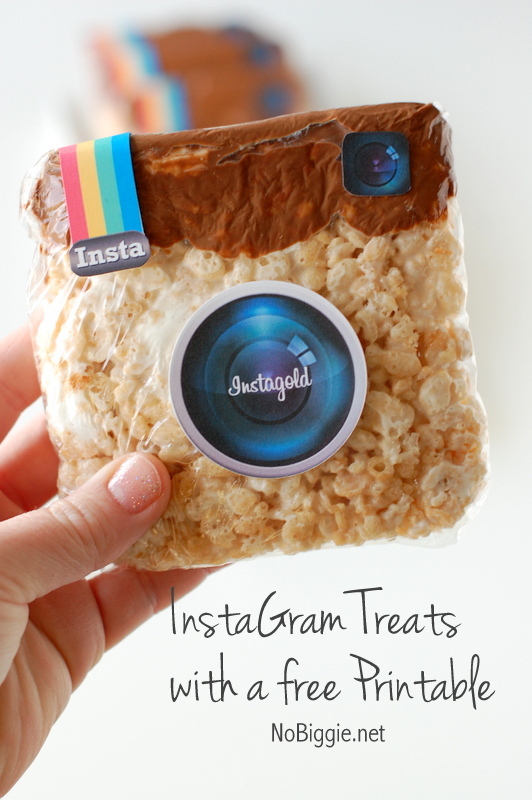 They would think you were gold if you dropped one by…instagold. Click here to download this InstaTreat printable. Please note all printables on NoBiggie are for personal use only. I’d love to hear from you in the comment section and ask that you share it on a social site too if you download. Also, be sure to tag me on Instagram (@NoBiggie) if you make them, I’d love to see! 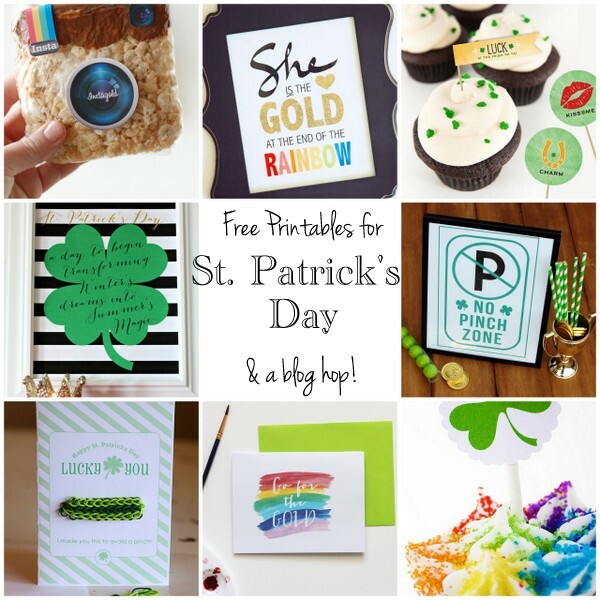 Ready for more fun and free St. Patrick’s Day printables? I’ve teamed up with seven fantastic blogs to bring you more free printables just in time this year. Click on each link below to view each site to download all of these free printables. If you receive an error message, click to the blog’s home page.